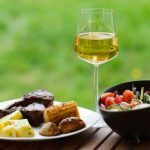 Home General Which Wines are Best for This Year’s Backyard BBQ? Light Beer or Lager: Try a Brut Cava, a smooth champagne that combines well with a variety of foods and offers a bubbly sweetness. Pale Ale: Go for the Pinot Noir, a red wine that contains a well-balanced body without running into the bitter taste that comes with darker red wines. IPA: Take a swig of Carmenere, a perfect combination of balanced savory, fruity and bitter flavors. Wheat Ale: Flood the tongue with a Buttery Chardonnay, a refreshing mix of sweet apples, lemon and vanilla that offers a smooth and creamy taste. Belgium Ale: A Shiraz or Grenache Blend will bless the tongue with a smooth and smokey sweetness that offers a well-bodied taste. Porter: Grab a glass of Bordeaux or Chianti, both hold a hearty portion of deep earthiness that pairs tremendously well with BBQ. Sparkling Wine: Goes well with burgers or sausage and combines perfectly with chicken. Does not go well with steak or vegetables. Sauvignon Blanc: Is a slightly good combination with chicken but does not combine well with other meats or vegetables. Dry Riesling: A decent choice with chicken and an excellent choice with sausage. Does not go well with steak, burgers or vegetables. Dry Rose: Makes a good combination with burgers and a great combination with chicken. Not a good choice for steak, sausages or vegetables. Pinot Noir: An excellent choice for chicken that can also be adequate for sausages and vegetables. Does not go well with steak or burgers. Zinfindel: An excellent choice for burgers or chicken and the perfect combination with sausages. Also does slightly well with steak but not vegetables. Carigan: One of the best combinations for chicken that also pairs well with sausage and slightly well with vegetables. Does not go well with burgers or steak. Carmenere: A one size fits all solution that goes excellent with burgers or vegetables, well with sausage and acceptable with steak. Cabernet Franc: Another adaptable choice that goes extremely well with steak or burgers, is the perfect combination with vegetables and can also go with chicken or sausage. Tempranillo: The best of the best when it comes to steak and can also be paired well with burgers and adequately with sausage or vegetables. Does not go well with chicken. Malbec: A perfect match for burgers and an excellent choice for steak. It also can be paired with vegetables. Does not go well with chicken or sausage. Syrah: Goes perfectly with steak and wonderfully with burgers. It can also be a good choice for vegetables and an adequate choice for sausage. Does not go well with chicken. Touriga Nacional: One of the best for barbecued burgers and a good choice for steak. It can also be paired with vegetables and makes an adequate combination with sausage. Does not go well with chicken. This year, plan the BBQ with a little sophistication and break out the wine.